A very personal look back at history……..
Before 9/11/01 there was 12/7/41. 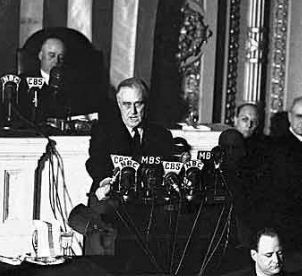 Roosevelt delivering his “day that will live in infamy” speech. Soon, the country will be commemorating the 70th anniversary of what was, in President Roosevelt’s words, the most dastardly act ever perpetrated against the United States in its short history. Volumes have been written about December 7th, 1941, but nothing quite captures an event like a first-hand account. Let me try to take you back there now. I had the privilege to know one of Tom Brokaw’s “Greatest Generation.” A man who was directly involved in that historical day. 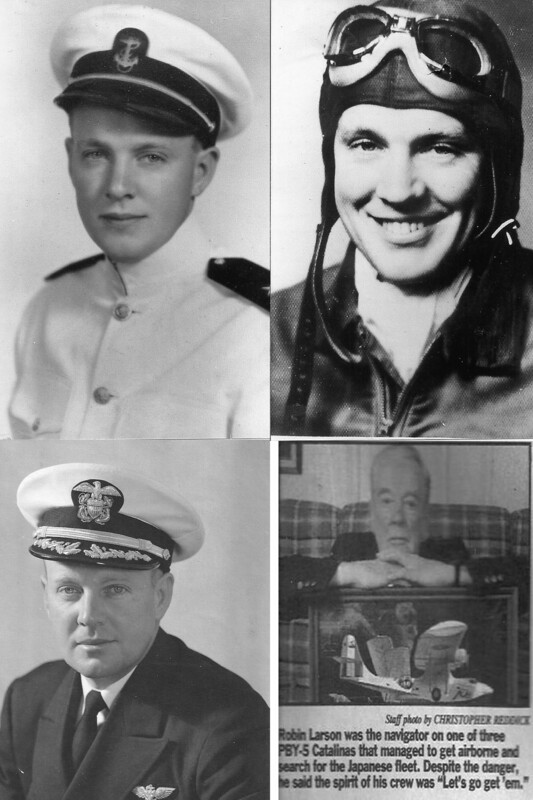 My father-in-law, Robin E. “Bob” Larson, was a naval aviator stationed at Pearl Harbor in 1941. A young Ensign, commissioned only 4 months prior, he was navigator pilot on the crew of a PBY-5 seaplane and was flying search and rescue patrols along the island chain. He had proven to be so astute at navigation that the other pilots had already tagged him with the nickname “Magellan.” His “ship” is below. Magellan was there that day, literally front and center in a panorama of grinding, twisting steel, catastrophic explosions and rising pillars of fire and smoke. His eyes grudgingly, yet unerringly, taking in the horrid scene unfolding before him. His nostrils quickly succumbing to the foul scent of burning flesh. His ears reverberating with the cacophonous chorus of shrieks and screams. All the sights, smells and sounds that invariably accompany the violent end of life. But there was no time to dwell on it. He was busy keeping himself alive. He had a job to do. After a long night watch, Magellan was unexpectedly awakened at 7:55 a.m. in his bed at the Bachelor Officer’s Quarters (BOQ) on Ford Island. 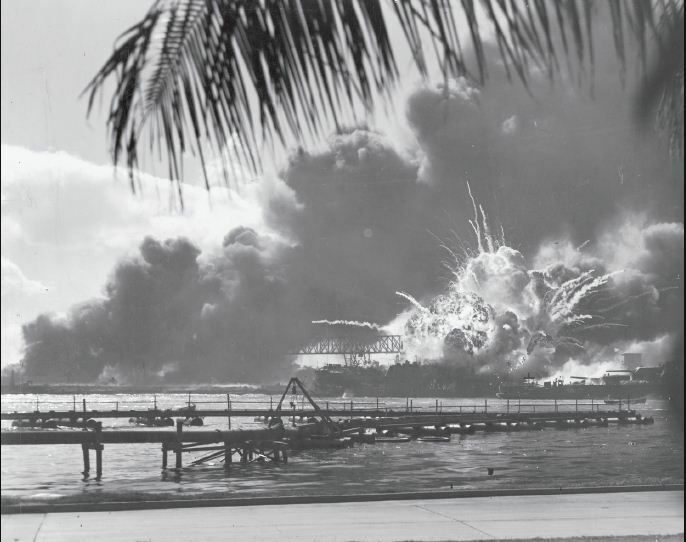 Startled by the shrill whistling of a Japanese dive bomber seeking its prey, followed seconds later by the ear-splitting detonation signaling the successful destruction of the USS Utah, mere yards from where he slept. Almost simultaneously, he began dressing himself and choreographing his way through the pandemonium that immediately prevailed. Eventually, he made his way out of the BOQ and hitched a ride with other stunned pilots on a flat-bed truck that had been commandeered to ferry them to their aircraft at the other end of Ford Island. Men who only the night before were envisioning a pleasurable Sunday afternoon spent sunning on Waikiki beach. But now here they were, sitting exposed on that truck, their legs dangling over the side, while all hell was breaking loose around them. The first moments of the attack photographed by a Japanese plane. Magellan is asleep in the BOQ, far left center of the picture. 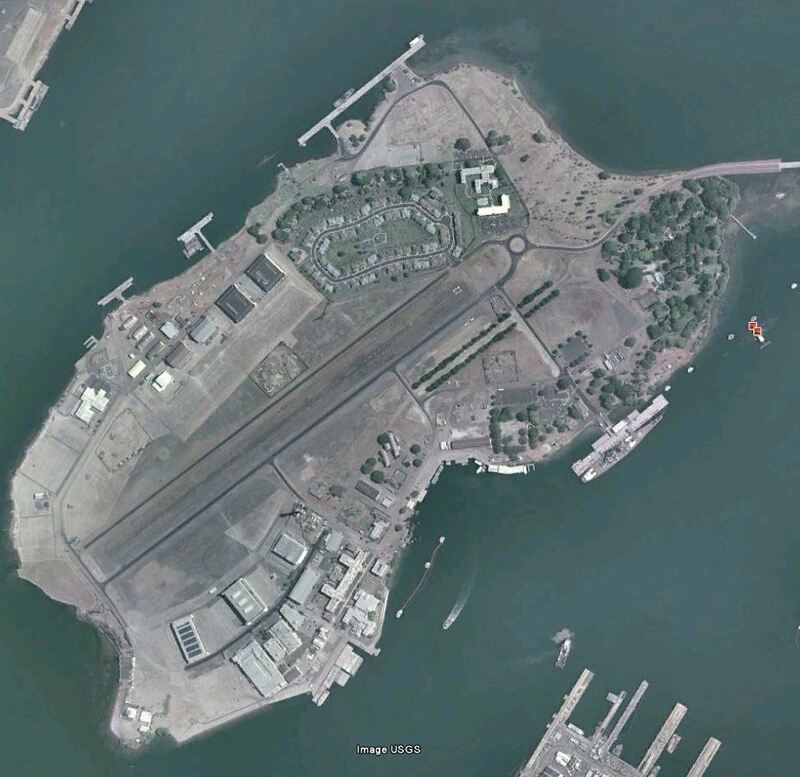 His plane is at the far right of the island. The water plume in the center is the first torpedo strike on the USS Oklahoma. Note the attacking plane just to the right of it. The BOQ is still there today, just above the white L-shaped building, top center. Bullet and shrapnel pockmarks remain on the outside of the building as mementos of that angry day. The gauntlet he would run between the BOQ and the hangars would have been sufficient drama for any man for a lifetime. But it was just the prologue. At intervals, he had to stop, jump off, then get under the truck to avoid the Japanese Emperor’s deadly calling cards, courtesy of the fighters that were strafing the island. Magellan was getting to know the perils of war well before his inaugural combat flight. In a surreal moment in the midst of all of this mayhem, one of the pilots suddenly provided some totally unexpected “gallows” humor. He had just purchased a brand new Ford and blurted out “If they put so much as a dent in that car, I will kill those Japs.” At one point, as Magellan was about to get back on the truck after a strafing run, he was knocked to the ground by a terrific blast. That marked the last vital moment of one of the proudest members of the Pacific Fleet, the USS Arizona and over 1000 of her sailors. The last moment that the Arizona would ever ride above the waves. At long last, arriving at the hangar area, the carnage that greeted him was unimaginable. 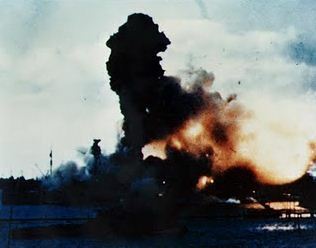 Two battleships, set afire and sinking, were so close that he could see the expressions of horror on the sailors as they faced an excruciating decision. Whether to stay aboard a crippled ship rife with acrid, deadly smoke or jump overboard into a cauldron of burning oil. Out on the tarmac only three of the 12 new PBY-5 seaplanes were operable after the precision bombing run of the well-trained Japanese. Patchwork crews were now assembling and loading weapons aboard, most never conceived for use on a flying boat. That didn’t matter, he was off to sink the Japanese fleet! Magellan found himself ejecting unwanted personnel off his aircraft. 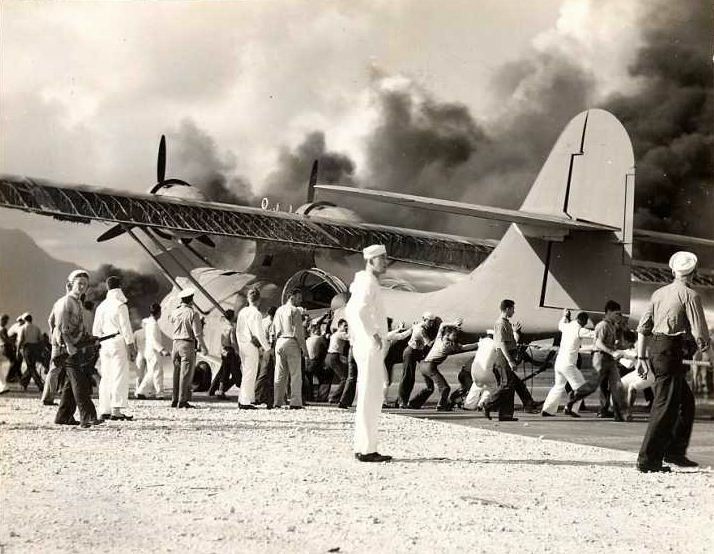 Everyone wanted to get aboard to “get back at those bastards,” but the additional weight would have kept the plane from getting up. In a rare moment of clarity, Magellan gave one of the ground crew his wallet and a few comments to pass on to his bride-to-be back in Iowa. The prospect of survival on this mission did not rank very high in his mind. This is the scene at the hangars just as Bob saw it. 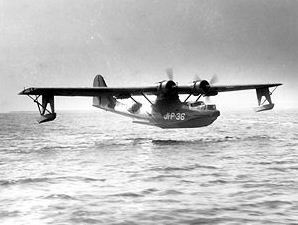 A relatively intact PBY-5 can be seen in the left background. Part of the superstructure of the battleship USS West Virginia can be seen just above the single engine seaplane, center right. Makeshift crews moving a damaged PBC. But the most daunting challenge was yet to come. Getting airborne. Traveling down the channel, his craft and pilot had the unenviable task of getting adequate airspeed on the water while avoiding the obstacle course of debris that was quickly gathering atop the waves. If that wasn’t enough, smoking oil slicks from stricken ships were starting to coat much of the harbor. A beautiful sunny morning was now looking more like the devilish dark of night. And what would be their reward for a successful takeoff? If they got airborne and made it back, they would get to navigate these same hazards upon their return. As they were attempting to take off, a tremendous explosion shook their craft. Out of the cockpit window, off to the left, they saw the USS Shaw erupting like a volcano in one of the more spectacular moments ever captured on film. Incredibly, the Shaw was salvaged and returned to the war. But get airborne they did. They immediately flew due west to exact the revenge that they thought was their destiny. Except for one thing. 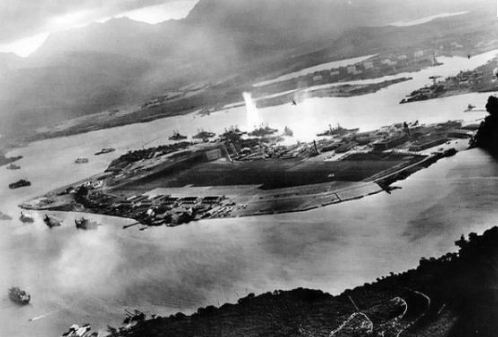 The Japanese attack had duped everyone by launching from the north. As Bob was later to say to me, I would be someone else’s son-in-law if they had headed in the right direction that fateful morning. Small wonder, as he was sadly over-matched in his lumbering PBY, a plane not meant for the zealous charge he was undertaking. Ironically, there was to be one more real, yet ignominious threat to Magellan’s well-being that day. Shell-shocked and disconcerted, the anti-aircraft batteries around the harbor assumed that any inbound aircraft was the enemy. Identification codes proved confusing and all but useless. A more user-friendly method was extemporaneously devised. It was promulgated to all commands that a plane was to bank in a certain manner when coming in over Diamond Head crater. That would indicate if it was friend or foe. Magellan’s plane banked correctly and thus avoided being one of several American aircraft that were shot down by friendly fire. Uneventfully and unceremoniously, they landed. 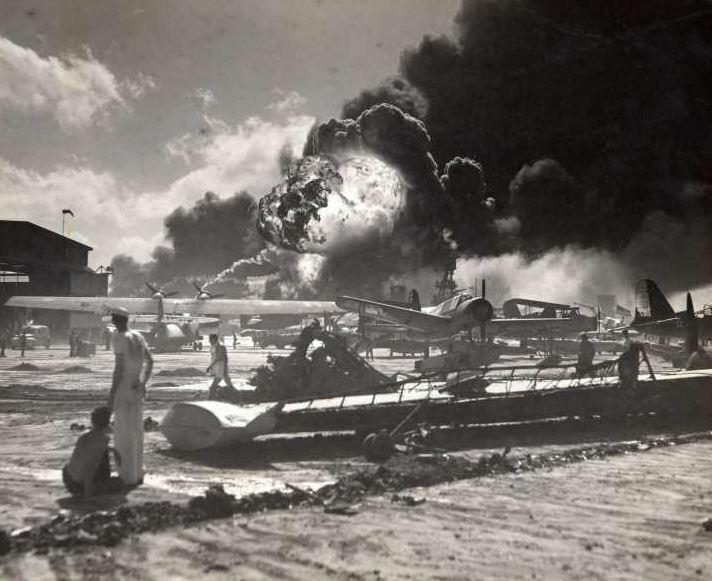 The assault on Pearl Harbor was over. Magellan went on to be involved at great risk in a large number of the battle zones in the Pacific during the next 3 1/2 years. You’d recognize the names. Names like Midway, Guadalcanal, Saipan and Iwo Jima. I remember going with him to the movie “Midway” back in the 70’s and Bob’s reaction when, in the movie, one of the scout planes sent the message “Sighted many Jap planes headed to Midway”. This was the message, verbatim, that Bob himself had relayed back from his patrol plane to the American carriers at the outset of the battle. What an emotional recollection that must have been. Upper left – Bob as aviation cadet at Pensacola. Upper right – Sometime during the war. Lower left – later in his career. Lower right – taken by local paper for an article on 50th anniversary. One of the highlights of my life was attending the 50th anniversary ceremonies of Pearl Harbor survivors with Bob, my wife and her mother. While there, we were fortunate to attend a speech given by another WWII naval aviator. He was no Magellan, but he had also made a sort of a name for himself. His name was President George H.W. Bush. Bob passed away in 2003, but I know if he were here, he would dismiss the talk about “Magellan’s” exploits and ask instead that we honor the ones that died that awful day without a fighting chance. I, for one, intend to do just that. 13 Responses to A very personal look back at history……..
Amazing rememberence and tribute to a hero. I still have a copy of his typewritten memories that give an incredible eye witness account of that day and many more of his missions. So glad to have known and been mentored by him during our visits each year growing up. Thank you again for sharing and I hope our current youth, and politicians learn from history. Glad you enjoyed it Bobby. Your family has much to be proud of. Very nice tribute Al. Thank you. I can’t imagine what it would be like to live through such an ordeal. My uncle Jack (last name Bailey) his brother George was on the USS Arizona when it was attacked. Every time I visit the memorial, and see his name up on the board, it’s hard to comprehend that day. What carnage. I guess it was one way to push the US into the war. What a solemn moment it must be when you see that name. It leaves you speechless when you look down in that water and know it it the tomb for 1100 men. Wow. Thank you for your nice comment, Peter. It was a privilege to talk with him finally about it. I would pick at him very slowly over the years, getting him to just talk for a minute or two, By the end he was willing to share in depth about anything I queried him about. Some day I will blog about the many times he cheated death during other missions. What a wonderful testimony to a great American. Our little community always holds a Pearl Harbor day memorial where they drop a wreath into the Illinois River. I stood out in the cold last Saturday listening to the band play the national anthem, listening to our lone, remaining survivor telling about that day in his quavering voice, watching the missing man formation fly over the river to a 21 gun salute and the mournful sound of Taps, and had to brush icy tears from my face. They really were the greatest generation. That’s a wonderful tribute you do every year. You are a true patriot, Peg. I met so many survivors that year I went out there. I think about how many of them are still living 25 years later. Very few I fear. Beautifully written, Al. The monumental events of history are made up of many thousand individual acts of courage, valor and dedication to duty. God bless all the Magellans and the ones who tell their stories. Very sweet and heartfelt remark, Bernice. Thank you. A mother like you, with a son who puts his life on the line to keep us safe, gives your comment great weight. Thanks, Jane. It was a struggle to get him to write and talk about those days, but I am so glad I persevered. And yes, Patty looks strikingly like her dad.